Inspired by the Sanskrit word for wisdom, Soneva Jani, the newest Soneva property to launch this October, will embody the brand’s ethos of intelligent luxury. Inspiring a lifetime of rare experiences, Soneva Jani, set within a lagoon of crystal clear waters, fringed by pristine beaches and blanketed in lush tropical greenery, will allow guests to reconnect with nature. When designing and building Soneva Jani, Founder Sonu Shivdasani was mindful that the area should remain as natural and beautiful as the first day he and Eva laid eyes on it. Guests’ days will be filled with yoga in the morning, bicycling along the island trails to the Eco Centro, discovering the lagoon’s marine life, dolphin cruises and Robinson Crusoe picnics. And the night life? An evolution of the water villa experience, each master bedroom will feature a retractable roof. Guests will sleep under the stars at a touch of the button, as the roof slides back to reveal the night sky. After an evening in the Observatory, guests will be able to identify Orion, the Southern Cross, the Bear and more constellations as they drift to sleep, with just the sound of the calm lagoon outdoors. This is inspiration in its purest form. Taking bookings from 1st October, Soneva Jani is the latest luxury resort from Soneva. 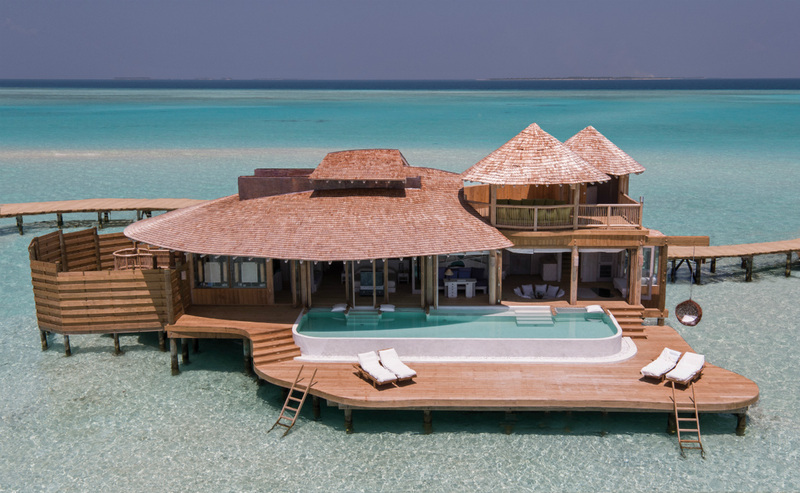 An evolution of Soneva Gili, the brand’s newest offering comprises 24 water villas and one island villa, with additional island villas planned at a later stage. Every water villa has a private pool and opens to its own stretch of lagoon, with some villas featuring slides going directly from the top deck into the lagoon below. Like all other Soneva properties, the spacious villas feature beautifully designed interiors by Eva Shivdasani, one of Soneva’s co-founders, and are made from the highest quality sustainable materials. The resort’s soft opening is planned for October 01, 2016, while the official opening date is fixed at November 05, 2016. Bookings are now available from October 01, 2016 onwards.